Scotsman William Wallace uses the steel of his blade and the fire of his intellect to rally his countrymen to liberation. 1995’s Braveheart provides a semi-mythological telling of a true story, and that seems appropriate as the current interpretation of the film's success enters the realm of mythology. Back when Braveheart hit screens in May 1995, it wasn't a hit with audiences or critics. Instead, Braveheart did pretty mediocre business and garnered a lot of lukewarm reviews. I don't recall that lots of people disliked the movie, but it certainly didn't generate an immense and/or dedicated audience. The film came and went pretty quickly, and I - like many people - rapidly forgot about it. That attitude changed in February 1996, when Braveheart received a stunning 10 Oscar nominations, including one for Best Picture. Frankly, I felt flabbergasted when this occurred, as it floored me that an apparent non-entity like Braveheart took home so many nods. That shock multiplied when the ceremony came and Braveheart nabbed the big prize, and I still don't know how this happened. Here was a movie that few critics seemed to like and that did modest business, yet it captured the Best Picture - had we entered Bizarro World? I don't intend all of these comments to indicate I don't like Braveheart, for I actually think it's a good movie. I just remain baffled by the legend that's grown around it, as the film eventually generated a "buzz" that seemed unrelated to its original success, or lack thereof. In any case, the buzz clearly exists, confusing as it may be to me. Braveheart offers a somewhat-fictionalized telling of the tale of William Wallace (Gibson), a freedom fighter initially sparked by vengeance who becomes a leader and unifying force in 13th century Scotland. How far astray from the facts does the film go? That I can't say, as I know little about the era, but IMDB and other sources detail "numerous historical inaccuracies". As a history buff, I acknowledge that I dislike these kinds of liberties, but I understand them and don't find them seriously problematic unless they create a serious misrepresentation of the facts, as occurred during JFK. The latter was an entertaining and technically solid film, but it grossly distorted reality to serve its message. I don't think Braveheart provides nearly that many problems, so I won't grouse too much about its liberties, and I also place Braveheart in a different category than JFK just because we know so little about the period in which Wallace lived. Some liberties had to be taken out of necessity, and unlike the lies told by Oliver Stone, you won't think less of Braveheart when you learn the ways in which it alters facts. The movie itself offers a fairly exciting and rousing tale of daring and adventure in which we see Wallace's crusade to drive the English from Scotland. The story itself is nothing particularly new, as plenty of similar tales have been told over the years. 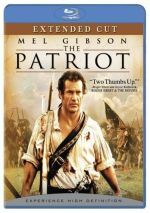 Gibson's telling of it is also not exactly revolutionary, but the execution seems strong, especially during the terrific battle scenes. Gibson makes these visceral and graphic, though not generally gratuitously bloody. As with Saving Private Ryan, the violence serves the story in that it lets us better appreciate the gravity of the fights. These scenes clearly offer the film's most distinguishing moments. Outside of the battle segments, Braveheart generally comes across as a good but unexceptional historical drama, and I think my main complaint with the film stems from the lack of depth displayed by its characters. With really only one exception - Robert the Bruce (Angus MacFadyen) – virtually all of the roles seem simplistic, so the good guys are true-blue, while the villains are bad to the bone. Although portrayed as a somewhat Christ-like figure at times, we don't find much complexity to Wallace himself. I expected him to display some sort of internal anxiety and emotion similar to what we saw in The Last Temptation of Christ, but similar agonizing doesn't occur. Such a lack of depth seems especially surprising considering the origins of Wallace's crusade. After all, he became spurred to action by a lust for revenge, but we see little sign of that spark as the quest for freedom consumes him. The baddies become similarly one-dimensional, and King Edward I (Patrick McGoohan) just needs a black hat and some mustache twirling and he'd fit right in with Snively Whiplash. The character is so uniformly evil that he seems unrealistic. In his audio commentary, Gibson even acknowledges that Edward was actually a good king - at least for England - but the film never portrays any positives. Frankly, Braveheart comes across like a more serious version of 1991’s Robin Hood: Prince of Thieves, especially during its climax. It's a better movie than the Costner effort, but it possesses a lot of the same spirit and tone. In any case, although I find Braveheart to be a flawed movie, it offers some solid entertainment and ultimately turns into a satisfying and moving experience. It didn't deserve to win the award as Best Picture, but Braveheart remains a strong piece. Braveheart appears in its original theatrical aspect ratio of approximately 2.35:1 on this 4K UHD Disc. While it didn’t leap off the screen, this still became a satisfactory presentation. Sharpness appeared very good most of the time. I noticed a few minor instances of softness – made during some darker scenes - but those failed to distract, so the vast majority of the flick offered solid clarity. Moiré effects and jagged edges failed to appear, and I noticed no edge haloes. Print flaws caused no concerns, and the movie showed a good layer of grain. Colors looked strong, with tones that were lush, rich and realistic. Braveheart wasn't the most colorful movie in the world, so anything set in the often gloomy realm of Scotland wouldn’t make sense as a Technicolor extravaganza. Nonetheless, the film offered a surprising range of hues, mainly manifested in the various costumes. We saw some very attractive reds, blues, yellows, and oranges through the different clothes, and the 4K UHD made them appear vivid. The disc’s HDR capabilities allowed the colors extra punch but not to the degree that the tones felt cartoony. Black levels seemed deep and they remained appropriately heavy without presenting any excessive thickness that would render nuances invisible. Shadows seemed smooth and well-defined. All of this added up to a largely appealing image. Downconverted to Dolby TrueHD 7.1, the Dolby Atmos soundtrack of Braveheart favored the forward channels in that the majority of the specific information came from those speakers and the three front speakers seemed very active for most of the film. That domain sounded alive and brisk with all of the movement but never appeared too busy or forced. The surrounds offered a lot of detail as well and they created an immersive experience throughout the movie. Although the rears generally maintained an ambient atmosphere, some good discrete usage occurred as well, and the entire package nicely complemented the on-screen action. Audio quality appeared positive as well, so dialogue always seemed natural and crisp, with no signs of edginess or any problems with intelligibility. Effects were bright and clear, and they always appeared realistic without any distortion. Some of the battle scenes really packed a solid punch. James Horner's score seemed bright and dynamic while it also sounded smooth and melodic. All aspects of the audio presented some fine range, and much of the film treated me to deep and rich bass. Overall, Braveheart sounded very good and just narrowly missed an “A”-level grade. How did this 4K UHD compare to those of the Blu-ray version? The Atmos track felt a bit more involving, and visuals fared better. The 4K UHD boasted superior delineation and colors, and it also lacked the smattering of print flaws from the Blu-ray. This turned into a pretty good upgrade. 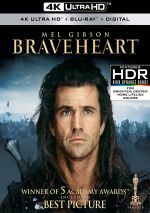 No extras appear on the 4K UHD itself, but a two-disc Blu-ray copy of Braveheart brings all the extras from the set linked above – mainly because it duplicates that release. On Disc One, we get an audio commentary from director/actor Mel Gibson. He provides a running, screen-specific chat. I really looked forward to this track but unfortunately found it to be a disappointment, and the biggest problem stems from all the dead air. I realize it’s tough to fill three hours, but Gibson doesn’t even come close, and I doubt he speaks for more than half the movie. All of that empty space makes the piece pretty tedious at times. In addition, some of Gibson’s comments - particularly during the first half of the film - provide fairly tangential information. Many of his remarks feel basic and concern locations and some bland details about the actors. This means Gibson doesn't offer a lot of facts about his involvement in the film, or his experiences as a then-fairly-new director. After all, Braveheart was only his second directorial effort, and was quite different from his first (The Man Without A Face), so it would have been cool to hear more about his trials and tribulations in that role. Gibson occasionally provides some reasonably interesting details, though. For example, he mentions some of the tricks he borrowed from other directors with whom he worked, and he gives us strangely compelling information about his use of varying frame rates, something you don't usually hear discussed. Gibson also does a decent job of telling us where the movie veered from historical fact. My father griped for years about Gibson's casting of himself as Wallace, since the character clearly should have been much younger than the then-38-year-old actor. I doubt it’ll satisfy my dad, but Mel sets the record straight on his reasons for doing so. The track definitely picks up its pace when we encounter the battle scenes. Gibson becomes much more animated at those times, and these sequences are when he relates the most compelling information. He really seems interested in the subject, and he offers a fair amount of good information at those times. Gibson also fills in some nice facts during the climactic torture scene as well. Gibson’s commentary provides enough info to merit a listen, but expect a frustrating experience. Disc One also provides Braveheart Timelines, and if you enter this feature, you can follow three chronologies. “Production Timeline” goes along with the development of the film, “Fiction Timeline” tracks various made-up events in the film, and “History Timeline” discusses the actual real-life elements. This feature didn’t run very efficiently on my Blu-ray player, so I found it clunky and difficult to explore. Nonetheless, I liked the concept, and my problems may be related to my specific machine; you should definitely give it a look on yours and hope that you fare better than I did. With that we head to Disc Two and its components. Battlefields of the Scottish Rebellion provides an interactive map that focuses on four Scottish locations. “Stirling” and “Glasgow” just show us text blurbs about their events, but “Bannockburn” and “Falkirk” allow us to “enter the battlefield”. That means a few different elements, and we get more text about the battles, but we also see chess-like computer representations of the conflicts. In addition, we locate a few soundbites from Scottish Arms and Armour author Fergus Cannan. The interface is a little clunky, but “Battlefields” nonetheless offers a moderately cool way to check out the film’s big fights. Next comes Braveheart: A Look Back. Split into three parts, the program fills a total of one hour, 23 seconds with notes from Gibson, producers Bruce Davey and Stephen McEveety, cinematographer John Toll, editor Steven Rosenblum, production designer Tom Sanders, makeup artist Lois Burwell, screenwriter Randall Wallace and actors Brendan Gleeson, David O’Hara, James Cosmo, Sophie Marceau, and Patrick McGoohan (from 1994). The show looks at visual and production design, sets and locations, cast, characters and performances, editing and cinematography, Gibson’s work as director, makeup, shooting action scenes, and the movie’s reception. Though it lacks much focus, “Back” compensates with a nice array of details. It covers a good variety of areas and does so with a mix of behind the scenes elements and interviews. I’d like something a little more logical and concise – this one really jumps around a lot – but at least “Back” provides an interesting retrospective. Smithfield: Medieval Killing Fields goes for 25 minutes, 19 seconds. It features Wallace, historians/authors Liza Picard and Lucy Moore, St. Bartholomew the Great rector Rev. Dr. Martin Dudley, and City of London guide/lecturer Leonard Phillips. “Fields” offers notes about Smithfield, the London location where William Wallace’s execution took place. We find useful details in this compelling little show. Plus, Moore is gorgeous – I could watch her read the phone book! For the 29-minute, 59-second Tales of William Wallace, we discover comments from Gibson, Davey, Randall Wallace, McEveety, O’Hara, McGoohan, producer Alan Ladd, actors Catherine McCormack and Angus McFadyen, and armorer Simon Atherton. “Tales” attempts to separate fact from myth as it explores what we know about the historical William Wallace. It’s good to learn more about the reality behind the film, and “Tales” provides a reasonably interesting take on its subject. In addition to two trailers, we finish with a featurette called A Writer’s Journey. The 21-minute, 30-second piece provides remarks from writer Randall Wallace. He discusses his pursuit of family history and how this led him to learn about William Wallace. The writer also chats about the development of the project and his script, research, themes and influences, and various issues that came through the writing process. Wallace provides an engaging discussion. Despite my continued bafflement over how Braveheart became an "A"-list title, I acknowledge that it's an entertaining and well-executed movie. The film contains flaws and is far from perfect, but it does a lot right and offers a generally stimulating experience. The 4K UHD brings us very good picture and audio along with an informative complement of bonus materials. This turns into a satisfying rendition of the film.